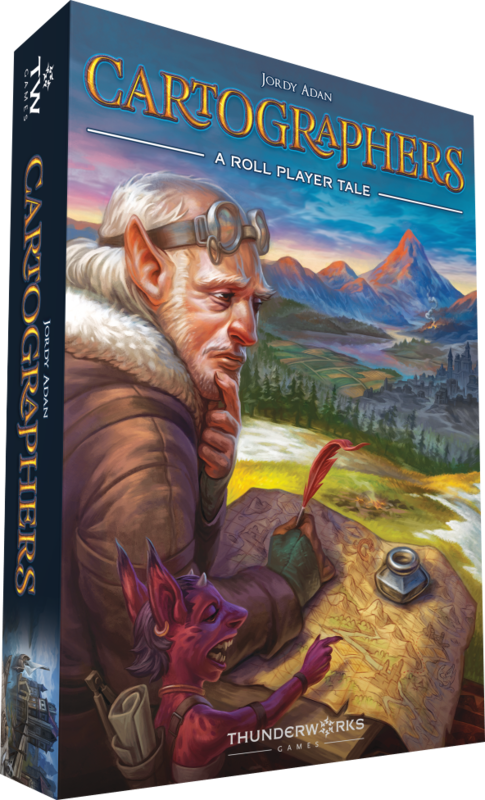 Cartographers Now Available for Pre-Order! Pre-Order Cartographers and we'll ship it to your home as soon as it arrives, or you can pick it up at the Thunderworks Games booth at Gen Con (Indianapolis, Indiana) in August and save on shipping! Queen Gimnax has ordered the reclamation of northern lands. As a cartographer in her service, you are sent to map this territory, claiming it for the Kingdom of Nalos. Gimnax’s edicts announce which lands she prizes most, and you will increase your reputation by meeting her demands. But you are not alone in this wilderness. The Dragul contest your claims with their outposts, and so you must draw your lines carefully to reduce their influence. Reclaim the greatest share of the Queen’s desired land and you will be declared the greatest cartographer in Nalos. In Cartographers, players compete to get the highest reputation at the end of four seasons. Each season, players draw on their map sheet and score against unique conditions at the end of the season. The player with the highest reputation at the end of the year is declared the winner. 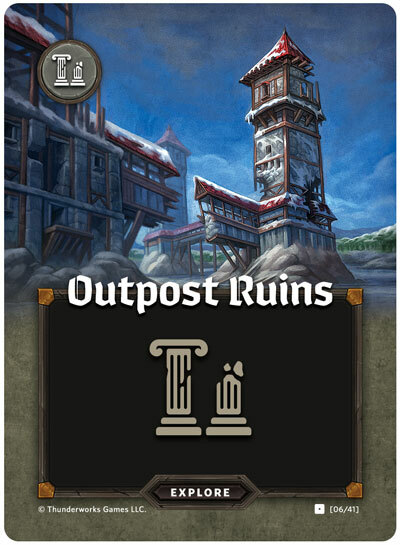 A player reveals the top card of the Explore Deck and places it face up in the center of the table so all players can see it. 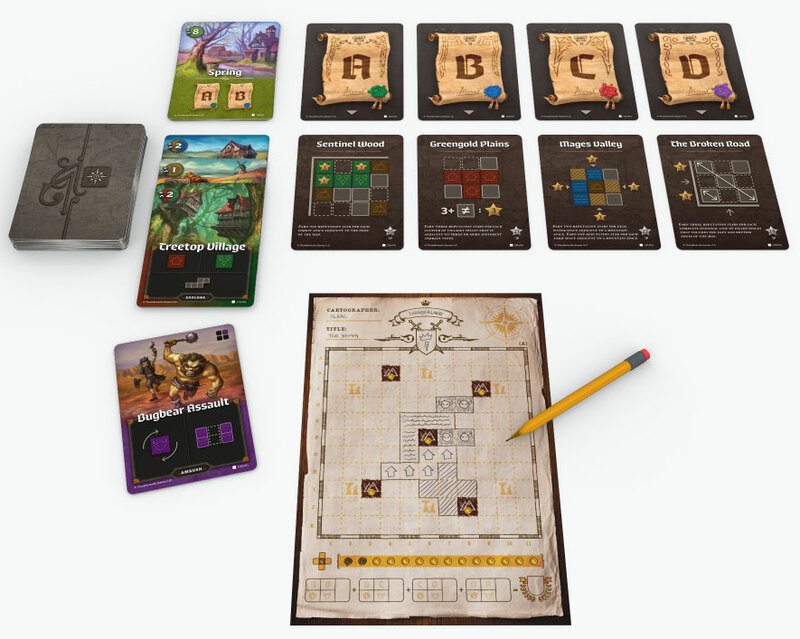 All players simultaneously choose one of the terrain types and one of the shapes depicted on the explore card and draws it on their own map sheet. At the end of the turn, the players check to see if the season is complete and players either move to the Scoring Phase or return to the Explore Phase. Once the players have met or exceeded the time threshold on the season card, the season is complete and players score their map. A new season begins or the game ends after four seasons. A game of Cartographers in action! What's This 8-Card Mini Expansion All About? 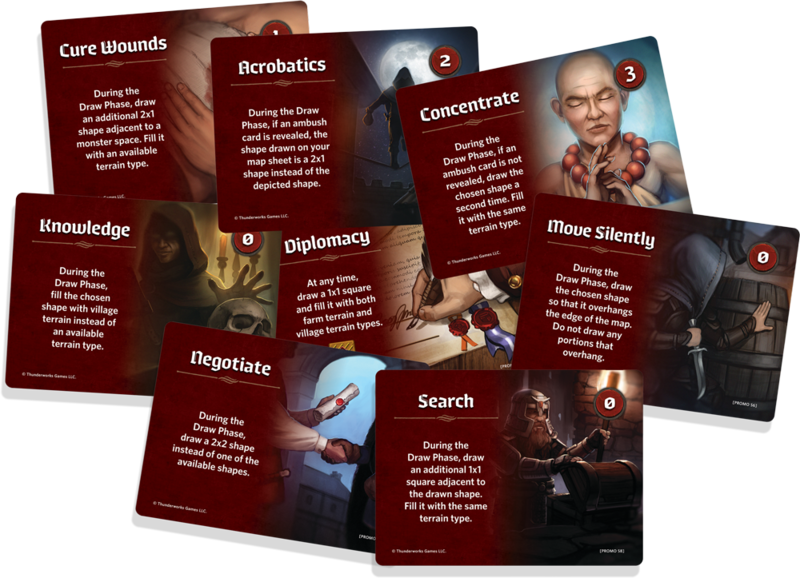 The artwork may be familiar to our Roll Player fans, but these assorted Skills add an interesting new way to play Cartographers. Most require you to spend some of your gold, but will your investments pay off in the end? Note that this expansion is included with all pre-orders for Cartographers, but will later be sold separately on BGG and on our website. Don't miss out!